BlackBerry Q5 launching in Canada August 13th, likely coming to AT&T in U.S.
BlackBerry officially announced the release date for its new Q5 handset in its homeland of Canada; and, according to famous leaker @evleaks, the device will be coming to AT&T in the U.S., but no release date is yet known for the U.S. launch. According to the official announcement, the BlackBerry Q5 will launch in Canada on August 13th. 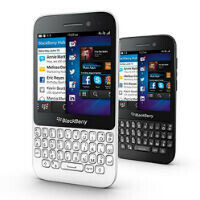 According to reports, the BlackBerry Q5 will be widely released in Canada, and will be available through Bell, Fido, Koodo, Sasktel, TELUS, and Virgin Mobile Canada, as well as retail stores Best Buy Canada, Future Shop, Target, TBooth Wireless, The Mobile Shop, The Source, Walmart, and WIRELESSWAVE, across the country. It should be noted that while that list makes up the majority of carriers in Canada, it does not include the largest carrier in the country: Rogers. Additionally, @evleaks has said that the device will be coming to AT&T, but no release date info is known yet. The BlackBerry Q5 will be a new handset designed for the enterprise crowd which wants a physical keyboard rather than a full touchscreen device. The device features a 3.1-inch touchscreen display with a 720x720 resolution, a full QWERTY keyboard, a dual-core 1.2GHz processor, 2GB of RAM, 8GB of storage, a 5MP rear camera, a 2MP front camera, and a 2,180 mAh battery. And, the device will come in either black, white, or red. I thought the initial reports stated the Q5 wan't making its way to the US? I hope BB can make a comeback, but I think it's too little too late. It looks like the HTC Status. Who cares? You do! Otherwise you wouldn't be posting. Show your hate of BB with the silent treatment. And if you don't believe that BB makes real phones, answer my challenge I gave you and BUY one! Otherwise you're still sharing a hollow opinion that I can find in the bottom of any trash can, toilet bowl or outhouse.